Wide Band EFIE/MAF/MAP 2 in 1 Combo Totally control all your sensors that hinder your HHO or Fuel Vaporizing gains from happening. Wide Band O2 sensors (5 wires) are in Toyota 1999 to 2016 , Honda, Nissan, Mitsubishi, VW and GM : Chevy, Cadillac, GMC, Buick, FORD, Chrysler : Dodge, Jeep 2010 to 2016 cars and trucks. If you have a Narrow Band O2 sensor go here. This all New Totally Automatic Temperature Activated 2015 Wideband AFR Control Center. Is now activated by the temperature of your engine. No guesswork or having to wait for your AFR Control to engage when your engine is already at operating temperature. 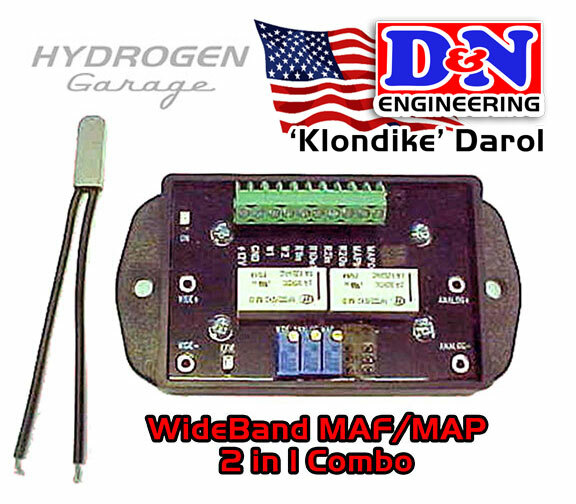 WIll cover 4 - wide band O2 sensor, plus voltage based MAF or MAP sesnor. It now features single wire connections for both your IAT & CTS controls. This one is for all of those Japanese and German built vehicles. If you own a Toyota, Honda, Nissan, Mitsubishi, Subaru, Volkswagen OR Many Many others, THIS IS A MUST. * For Narrow band O2 ( older cars) GO HERE. for the DIESEL EFIE for diesel /biofuel engines. YOU MUST HAVE AN OBD II PORT MONITORING DEVICE IN ABLE TO THE TUNE THE AFR CONTROL CENTER.